Historical fiction, mysteries, family, travel journals, memoirs, crime thrillers. I Just love a good read. "I live life with passion, compassion, a sense of humor and some style" - Dr. Maya Angelou. As anyone who has visited China would tell you, it is not an open society, which welcomes foreigners under the current Communist regime. Social conditioning and prejudice towards foreigners are present in all societies, but in a competitive, closed society such as China, the chances to get away with anti-western sentiments is much nearer to 100 %, as well as safer to maintain the status quo in that part of the world. Even the internet is severely guarded and strictly monitored. With that said, it is difficult as ordinary citizens, to make sense of the deep economic inter-dependencies of the two international gigantic economies and what the end result will be. 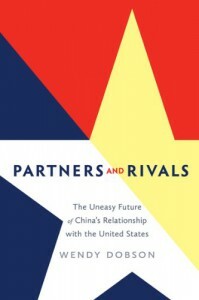 "Partners and Rivals- The Uneasy Future of China’s Relationship with the United States" explains the situation and opens up the uncertain world that is hard to comprehend for most people like us. The reader learns what exactly it is that the fastest growing economy, China, needs from the rest of the world. First off, the book has a 25-pages introduction to summarize the book. Secondly, it has a 10-page bibliography with a comprehensive index at the end of all the terms used in it. The acknowledgements: almost 3 pages long. "This book builds on my 2009 study of China and India, "Gravity Shift: How Asia’s New Economic Powerhouses Will Shape the Twenty-First Century." The author also visited China several times and is familiar with the core of the challenges facing both countries. I review this book as a non-citizen of both countries and how the book contribute any new information that will inspire fellow non-citizens to read it. I am sure there will be enough inhabitants of America who will share their opinions on the book as well. My comments, which is summarized, center around the American-Chinese relationship and how it impacts on the rest of the world, since I am a nonresident reader of both countries and try to find the importance of this message to us. Although it is not an easy read, you need to concentrate, it does bring together the opinions of various influential players in the field as can be seen in the bibliography. The internal problems which the Chinese government has to face are applicable to all societies in the world, except that the restrictions posed on the citizens are far more severe than anywhere else. For instance, the one-child policy resulted in a dramatic decrease of child births, but it also resulted in the demographics becoming seriously unbalanced. A minority of young people have to support a majority of older people, with the forecast of negative economic growth as another result of the decision. Back to China: It is the only country in the world who tried to stop an uncontrolled explosion in human childbirths even though it was done in an unacceptable way. With the negative effect it had on the economy, talks are doing the rounds that it will be reversed. With the scarce natural resources, the appalling pollution problem with its associated health problems, the future does not look well for the planet. The USA are the biggest owners of private property, but China is the biggest owners of cash. China also owns the biggest share of the USA's foreign debts. 40% of the USA expenditure is financed by foreign loans. Both countries need a healthy growth rate to sustain their economies. It is important for China to ensure a healthy economy in America so that their imports and loan repayments can be sustained. China's domestic problems are the same as any other nation's, including the USA's. The loss of jobs and incomes promise revolt and instability, not to even mention the ever increasing crime rate and burden it has on the state funds. It is therefor crucial for both governments to address this threat that can lead to civil unrest. The book provides an interesting, comprehensive and informative view on this bilateral relationship. It is an important book for ordinary American citizens to read who do not want to spend hours and days on the internet, reading the same information. I prefer to read books like these, instead of lose articles. China's influence in the world is rising while the USA 's is dwindling. Yet China also has to take care of internal problems which could cause instability if not addressed. It can have a severe effect on the rest of the world. South American, South East Asia, as well as African countries are dependent on their export of commodities to China (they have become enslaved to it) and have little power when it comes to protecting their natural resources or economies. China, as the biggest role player in Africa, needs these commodities to ensure stability in growth for not only China, but also the rest of the world. It is a complex situation. With the fastest and biggest population growth on the planet, and another few billion people globally already eager to join the middle class, China(1.351 billion) and India(1.237 billion) will become the focus of job creation challenges and opportunities. There is simply no sector of industry which cannot be duplicated by the Asian countries. Manufacturing- as well as service jobs are already there. It leaves the rest of the world with huge challenges to survive economically, including Europe. The social burden on governments are becoming bigger and bigger demanding more tax increases, more loans from China to sustain their own populations' spending. China subsidizes the financially dependent countries to ensure a steady growth rate, but also inadvertently allow them a greater influence on national as well as international policies. The book discusses the situation between the USA and China, and focus on an American audience in addressing the situation. The influences and effects on the rest of the world is also touched upon. However, the rest of the world play a pivotal role in feeding these two monstrous economies' appetite for raw materials and minerals. For instance, Africa's development, sponsored by the big economies, are done mostly in infrastructure which benefit the outside economies, such as roads, harbors and mines, with nothing, or hardly any, restoration incentives demanded for recuperating the enormous damage to the environment afterwards when those interests in Africa fade. Lack of local manufacturing opportunities also results in a severe overutilization of natural capital to survive by the continents' own people. "Development" in Africa means to find the quickest and cheapest way of transport out of the continent for the raw materials. Compensation to governments gather moss safely in Swiss bank accounts while the inhabitants are starving. High taxes, as well as strict import agreements in other countries for locally manufactured goods are killing off the continents' own industries. The same for the rest of the world who are the providers of minerals and commodities. A non-sustainable perk for countries such as China, is the pool of uneducated, poor people who can be utilized to produce the cheapest products in the world. But as the middle-class is expanding in China, higher wages will bring China into the fold of economically low growth rate economies such as the First World group. China is also currently exporting their unemployment problem to places such as Africa. Millions of Chinese workers are brought to the continent to do the jobs on the infrastructure development sponsored by the Chinese government. Separate towns are even developed to house them and their income goes back to China, with little, if any of it, spend in the host countries. This situation is leaving the host countries poorer and deprived of all those job opportunities. South America: "Experts also see risks for the environmental protection. The route of the Nicaragua Canal will pass through protected areas. Environmental activists already announced protests. Environmental organizations blame Beijing and its appetite for oil for the failure of the well-known Yasuni-Initiative, which fought against the exploitation of protected rain forest. The Partners & Rivals summarize the challenges around the ever-increasing world population but focuses mainly on two competing giants. However, this challenge does not only effect the USA (313.9 million people). The rest of the world is scrambling for the morsels falling from the table set for the two biggest players. "A powerful China is coming, and we have two choices. Either we're at the table, or we're on the menu," says Fitz-Gerald, who adds that China isn't the enemy. "Good news from China is good news for the U.S.; bad news from the Chinese economy is bad news here. "(Source) That also counts for any other nation in the world today. Nobody is disconnected from this power play between the two competing Big Brothers. My personal opinion in concluding the review: uncontrolled human birth numbers are the biggest obstacle and threat to the current world. We all know that. Decreasing the number of births impacts severely on natural, economical, personal, government as well as social services. Increased numbers will destroy the planet. It is a catch-22 situation and a serious one. We cannot blame governments for this problem that we as citizens create. Understanding the challenges is better than living in ignorant fear. So, dear friends, this book is for you! For all of us. Let us read it.